In early January of this year, Peaceful Assembly Church pastor John Connell died inside his church as it somehow set ablaze. The alleged cause of the fire has still not been publicly announced by the fire marshal, several months later. Speculation on the cause of the fire ranges from accident to self-immolation to murder. 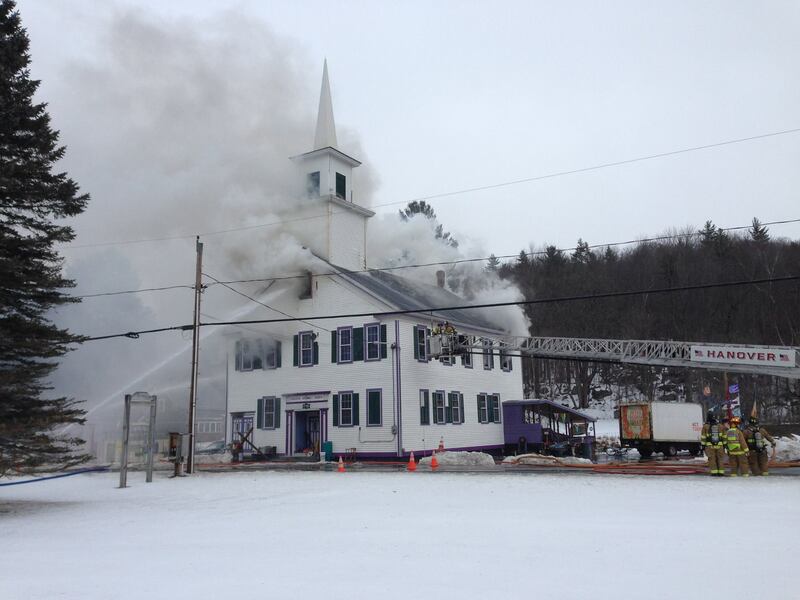 Given that the town of Grafton was planning to steal the property via tax sale just days after the church caught fire, it’s possible that Connell set the fire himself so as to prevent the town from getting anything of value out of the coming theft. Regardless of the origins of the flames, the latest results were unexpected. The Valley News reported yesterday that Grafton has come to an agreement with the Peaceful Assembly Church to give them the tax exemption they have been denying the church for more than half-a-decade! Under the agreement, the parties agreed that Peaceful Assembly “is a regularly recognized and constituted religious creed and sect” and that the town will abate the full amount of taxes owed on the property at 860 Main St., also known as Route 4. In return, Peaceful Assembly Church board members agreed to make the building weather tight by December; shingle the roof and complete all exterior work except windows by December 2017; and complete all exterior work by December 2019. Peaceful Assembly Church is the first church in NH founded and run by liberty activists and was a major influence in the formation of the Shire Free Church. This is huge news in favor of religious freedom – it’s a shame the pastor had to die to make the right thing happen. Glad they finally got the tax exempt. Sad it took so long and his death to make it happen. The building is a historical building. A lot of historical buildings are made tax exempt so the owners can continue to keep the building up to code which is a requirement to be tax exempt. If they fail to meet the obligations for up keep, they will lose the building. Making the is historic building tax exempt has nothing to do with the false church freekeeners have made up. You’re on a roll today, two oxymoronic posts already and it’s barely midday. Keep in mind the “good people” of Grafton in their zeal to shoot themselves in the foot to prove how bad “freedom people” are, voted in an acceptance of fraud in their elected officials. Grafton had to watch a man die before they would approve this. They’re like Satanists demanding a sacrifice before their Dark Lord -their tax collectors- will allow something to be free of them. They’re just terrible, repugnant people. Disgusting, all of them. please keep your facts straight… John Connell did not burn alive in this fire. He was also not opposed to the property defaulting back to the town, since the BOD he sold it to had betrayed him. Jumping Jacks Now now, Jacks, surely you could contribute more than just outrage that there are people here who rightly show little enthusiasm for property taxes? Your refutation is high on allegation, but scant on logic. Combining two opposing terms into one concept is a gateway drug to a cognitive dissonance addiction. Might I suggest some form of rehab for you where you can gain some perspective that doesn’t rely on a contradiction? WEEDA CLAUS Jumping Jacks Indeed WEEDA. Jacks has a long history of making allegations with few attestations to support them. Despite that, his buffoonery is usually quite entertaining. So much so, that I often wonder if Jacks is merely playing a character of some sort.